Almost all of us have experienced back pain of some kind at one time or another. It is one of the most common health conditions to affect adults in the UK and around the world. In fact, back pain is the number one reason we, as a nation, take time off work and it is the largest single cause of disability in the UK. In total, back pain is thought to cost the National Health Service around £500 million a year. Even daily tasks you may think of as harmless can put strain on your back and result in increased discomfort over time. But understanding the potential causes of back pain can help you to protect yourself against the issue. There are a number of measures you can take to treat back pain effectively and reduce the risk of its return. These can include regular stretching, mobility work and strengthening exercises, but can also involve simple changes at home and at work, such as altering seat and screen positioning at a work desk. With so many contributing factors to back pain, it is always best to seek help from expert pain specialists in London to provide you with a targeted treatment plan. The first thing to know about lower back pain (the most common form of back pain) is that there can be any number of reasons for the pain. While the general symptoms can feel similar, the underlying problems causing the discomfort can actually be quite varied. While some people suffer from back pain caused by a trauma – resulting in a sudden, acute pain – the majority of sufferers actually find that back pain actually develops over time as a chronic problem. Back pain also often leads to limited flexibility, and a reduced range of motion, particularly in movements that place strain on the spine. If your back pain doesn’t improve with rest and basic stretching, consider seeking the help of expert pain specialists in London or your local area. Physiotherapists can not only treat the immediate pain and symptoms associated with your back pain; they can also look deeper at the underlying problems that may be contributing to your discomfort or making you susceptible to recurring problems in the future. You should also seek out a physiotherapist if your pain extends down one or both legs, or if you feel significantly less mobile and weaker as a result of your pain. 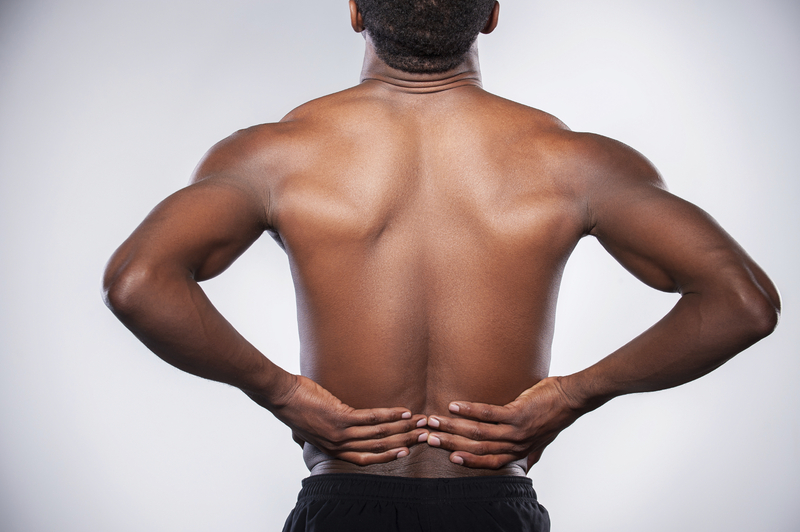 In rare circumstances, back pain can be a symptom of a more serious medical condition. If you’re experiencing back pain for the first time over the age of 50, or if you have a history of cancer, osteoporosis, steroid use or substance abuse, then contact a doctor. You should also consult a doctor is your back pain causes bowel problems, is accompanied by fever or follows a serious injury. – Muscle or ligament strain: Strain on the muscles is a key cause of back pain, often brought about by sudden or awkward heavy lifting. Constant strain on the spine can cause painful muscle spasms, especially if you aren’t exercising regularly. – Arthritis: Back pain can be a sign of a wider condition, such as osteoarthritis. This can seriously affect the lower back, and can sometimes lead to a narrowing of the spine around the spinal cord which can make pain worse. – Bulging or ruptured discs: Discs act as cushions between the bones of your spine, but the soft material inside a disc can bulge or rupture and press on a nerve. This can result in severe back pain. – Osteoporosis: The vertebrae of the spine can develop compression fractures if your bones become brittle, and this is what’s known as osteoporosis. One of the early warning signs of this condition is spinal pain. – Skeletal irregularities: If your spine curves abnormally, back pain can occur. This can be the result of conditions like scoliosis or simply poor posture. – Excess weight: If you are overweight, you are giving your spine more weight to carry, which puts additional pressure on your back. – Smoking: Smoking is well known for being one of the least healthy habits you can have. But while much of the focus is on the damage that smoking can cause to the lungs and cardiovascular system, it is also apparent that smoking can impact on spinal health and the musculoskeletal system. – Psychological conditions: Mental health conditions like depression and anxiety can make you more prone to poor posture and poorer overall health, which puts you at greater risk of back pain. Preventing back pain is largely about keeping your back healthy and strong. Regular low-impact aerobic exercise is a great start for those who wish to not only build up their fitness but also increase the strength of their back. A focus on flexibility and mobility work is also key to long-term back health. This can help to ensure that the spine remains in a neutral position and that the muscles surrounding the spine are able to contract and relax as intended. Yoga and Pilates are considered to be particularly beneficial in maintaining and improving strength and flexibility. Building muscle strength and flexibility in your back and core can significantly reduce your chances of back pain, as can maintaining a healthy weight. Even making changes to your work station – including your chair ergonomics, desk height and the position of your monitor – can have a very real impact on your back health. To treat back pain effectively, seek advice from pain relief experts who can treat your symptoms first-hand and provide you with a detailed care plan of how to reduce your back pain at home.